This trail parallels the Hudson from Yonkers to Tarrytown. It has a break at both ends from the OCA itself. Lots of history can be found at Ossining History on the Run. 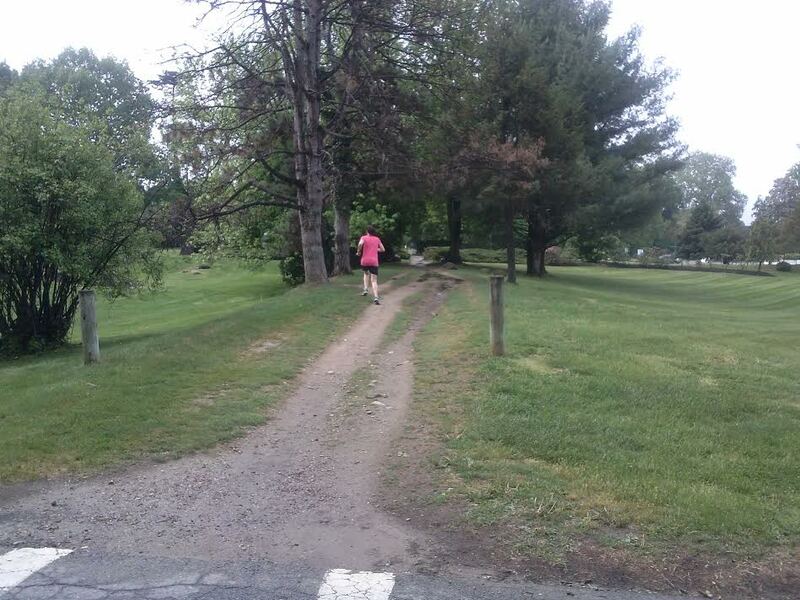 I view this as two trails, using Hastings-on-Hudson as the starting point. I park on Washington Street, to the west of Broadway/Route 9. It is generally wide enough for two people. It is flat as a pancake. There are no turns. I have the total distances as about 9 miles, end-to-end. There are numerous road crossings along the trail, including some major ones (Broadway/Route 9 twice). But the smaller ones tend to have good visibility. To the right is a typical crossing in southern Irvington, just north of Mercy College; you see the stop signs, which are just for the OCA. DIRECTIONS: From the south, use the Saw Mill River Parkway, exit 12 (Farragut Parkway) (left exit (see below)). At first stop sign, turn left. At the end, take left and first right is Washington. 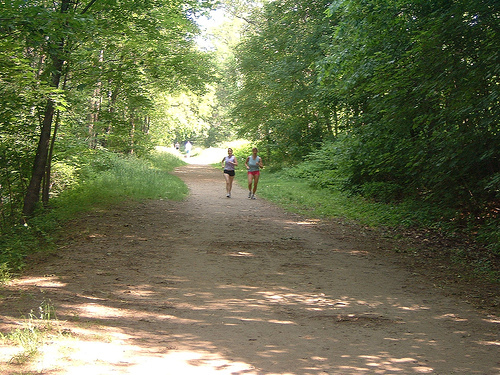 You can, of course, pick any spot along the trail to join it; Broadway (Route 9) parallels it. I think Washington Street is the quickest from the south. To the north (MAP), there are many street crossings, including significant ones. There are a couple of stretches, in Dobbs Ferry and Irvington, where you run through a parking lot. Just keep heading north, and you’ll pick up the trail again. Plus there are more people walking. Be mindful of the many ROCKS that appear on the course, to avoid tripping. 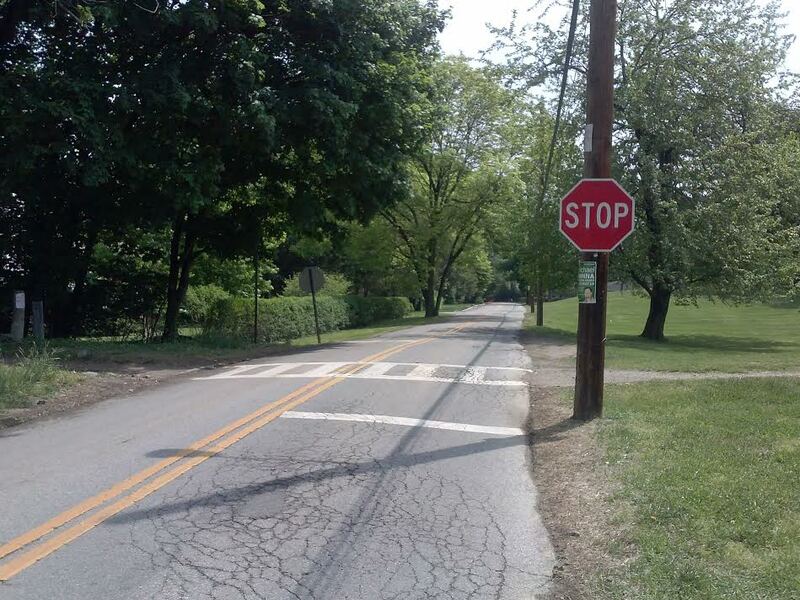 Most of the crossings north of Dobbs Ferry have crosswalks and stop signs for traffic. The crossings in Dobbs Ferry have neither crosswalks nor stop signs. 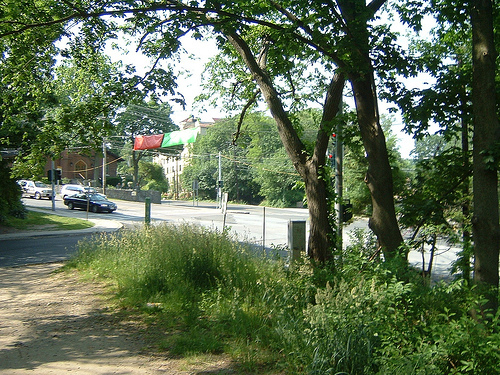 The picture to the right is taken from the north across Route 9. You must cross from the trail to a spot that’s in the middle of the photo to pick up the OCA again. This is right after you start the run from Washington Street (viewed from the opposite side). Although in theory one can connect to the south with the OCA south or to the north with the OCA north, I’ve not tried it, and it involves some major road-running.